On 7 October 1983, the University of Cape Town's Groote Schuur (translated as "big barn") Campus was declared a national monument. Originally, in 1829, South African College (later renamed to University of Cape Town) trained students in a building in Long Street. 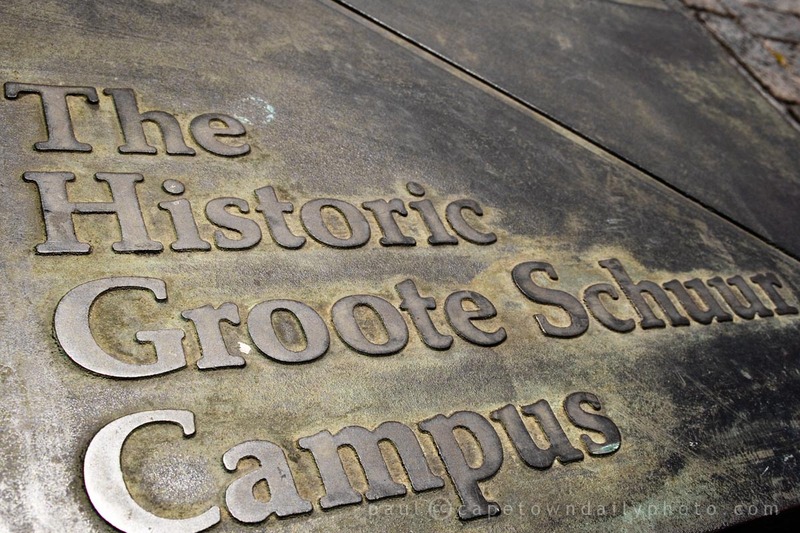 In 1841 they moved to Government Avenue, before finally taking occupation of the Groote Schuur campus in 1928. Posted in Sights and tagged education, history, sign on Saturday, 20 February, 2010 by Paul. It is indeed a beautiful campus. I was lucky enough to spend the first year of our six year medical degree there before being banished to medical school campus in Observatory, which was much less beautiful. Thanks Paul! My brother thinks I’m far too verbose. Really adore your blog, it’s a daily stop during my cyber-travelling!